There’s life in this season yet. After Town’s 1-0 victory at third-placed Fleetwood on Saturday, the chances of the Robins avoiding the drop have shortened. There’s hope now. There’s a chance. And, for the good of our club, Trust STFC is urging all supporters to put all other issues to one side for one game and cheer our team on to another crucial victory. MK Dons visit the County Ground this weekend. Swindon, with a win, could find themselves out of the relegation zone. That would be a remarkable change of fortunes given the barrel-staring we all put ourselves through just a few weeks ago. 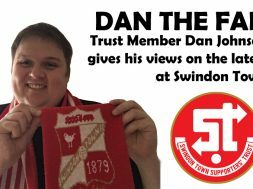 We all have opinions on how the club is run, how it interacts with our community and how detached it might feel from the Swindon Town we fell in love with. But we’re all agreed on one thing. There isn’t anyone on this planet with a soft spot for Swindon who wants to be watching League Two football next season. As supporters, with just five matches left to prevent that fate, we’ve only got one card left to play. 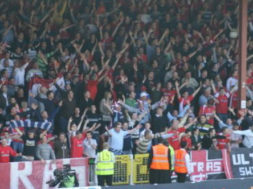 Trust STFC are urging fans to ‘Pack The Town End’ this weekend and make life as difficult as possible for MK Dons. The club have already reduced ticket prices for the game, and adults get gain entry to the Town End for £15. Students, OAPs and Under 21s can all get in for a tenner. Click here for all the details. Let’s do more than moan. Let’s work together. Let’s help Nathan Thompson and his team over the line to the Great Escape.